To those readers and jazz listeners of a certain age, Minton’s Playhouse was a Harlem jazz club founded by tenor saxophonist Henry Minton in 1938. It gained its fame in the 1940s as the home for the development of bebop and its innovators such as Charles Parker, Thelonious Monk, Dizzy Gillespie and Kenny Clarke.But, with time, the club and the music eventually faded away. However in 2013 the name was revived by entrepreneur Richard Parsons and this delightful musical romp by the JC Hopkins Biggish Band entitled Meet Me At Minton’s is worthy of its name. JC Hopkins Biggish Band is cracker jack outfit that plays with a whole lot of enthusiasm and cohesiveness. The ensemble is especially adept at providing sympathetic support for the vocalists that appear on every track due in no small measure to the arrangements by Wayne Tucker, Cory Wallace, J.Walter Hawkes and Chuck MacKinnon. Brianna Thomas is given ample chances to shine on three numbers starting with “Remember When” and “Meant To Be” both JC Hopkins compositions and then the standard ”Them There Eyes”. From the very first number Thomas shows she is in control as she swings out in delight and the band whips along behind her. One of the names, that back in the day, gave Minton’s its caché was pianist Thelonious Monk. He is amply represented here with three of his classics: “Suddenly (In Walked Bud)”, “Looking Back (Reflections)” and “How I Wish (Ask Me Now)”. That master of vocalese and scatting Jon Hendricks, now ninety-six, gives the first and third number the benefit of his experience ably assisted by up and comer Jazzmeia Horn on the latter. While his intonation is a bit shaky, he shows he is still in the game. On the middle number, Andy Bey with his full rich baritone captures the tune’s essence. 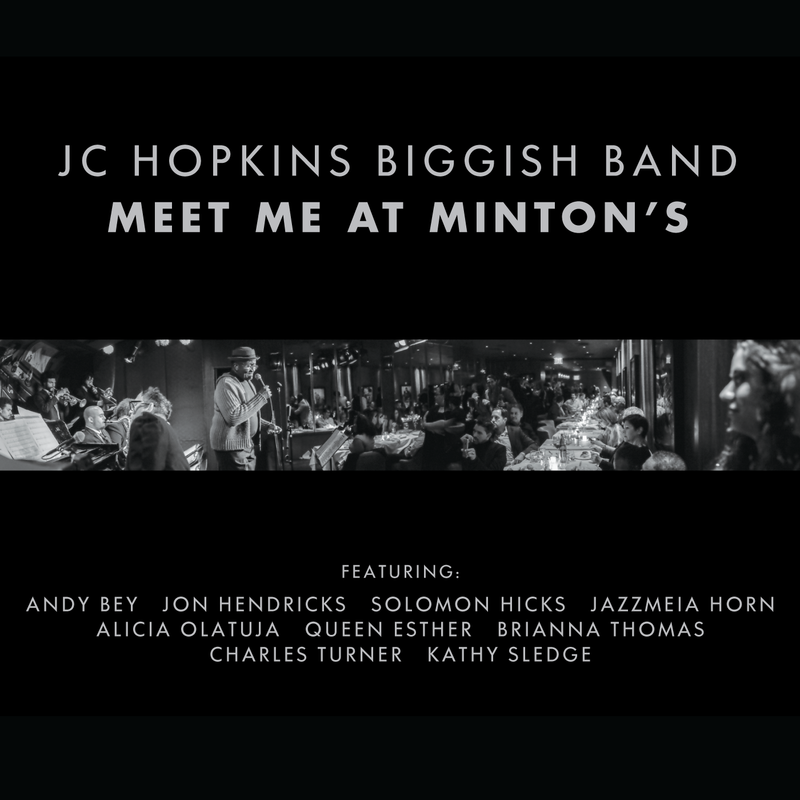 JC Hopkins wrote the title track “Meet Me At Minton’s” wherein Queen Esther and Charles Turner take a musical journey back in time with recounting of the jazz artists that played there, along with its raison d’être. All in all this is a trip worth taking.